Bonus Spin is new technology available in Blackjack games provided by AGS, a San Francisco-based gaming company dedicated to the production of casino games. The feature is available in the land-based version of Blackjack developed by AGS and it is implemented in the online Blackjack game players can enjoy from the comfort of their homes. This is definitely not the first Progressive Blackjack game but Bonus Spin stands out from the crowd as it provides players with a chance of hitting a progressive jackpot and other lucrative prizes by spinning the bonus wheel. Players can place a Bonus Spin progressive side bet and win if an Ace is one of their first two cards. If they are dealt a Blackjack, they will be offered to press the Spin button on the bonus wheel. The bonus wheel contains different cash prizes including a top progressive prize. The layout is user-friendly and provides players with all the needed needed information about the gameplay. Check out here for more new blackjack games. The game starts when the player places a bet by choosing chips with the denomination of $1, $5, $10, $25, $50 and $100. Only a $5 chip can be placed on the Bonus Spin bet. Both the player and dealer are dealt two cards and the first dealer’s card is dealt face up. 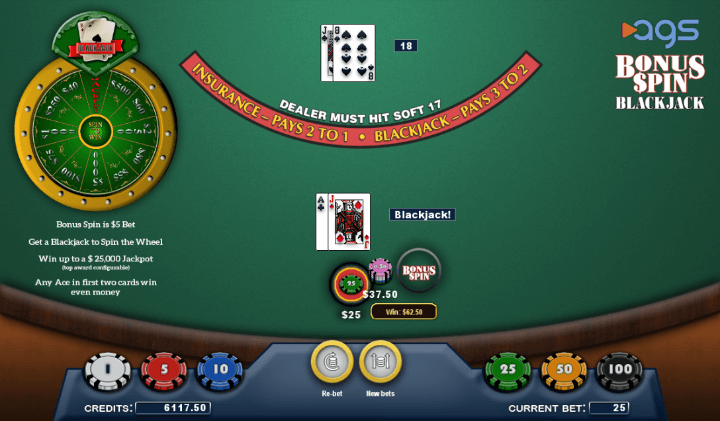 The player can be offered to take insurance which pays 2:1 in case the dealer has a Blackjack. If the player receives an Ace in their first two cards, they are paid even money. A Blackjack pays 3:2 and when the player gets a Blackjack hand, the bonus wheel will appear with various money prizes and a progressive top prize. The player should press the spin button to hit one of the money denominations. Bonus Spin progressive side bets lose if the player is not dealt an Ace or Blackjack in their first hand. 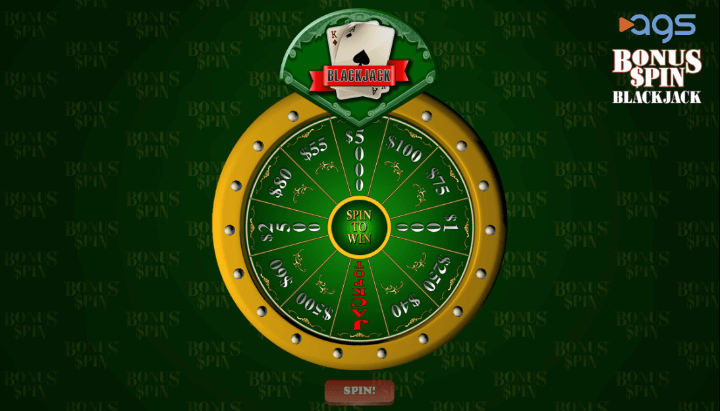 Bonus Spin Blackjack comes with a user-friendly interface and customisable features such as bonus awards and a betting range. The betting range will suit both beginners and high rollers as it allows placing from only $1 up to thousands of dollars per round. The Bonus Spin feature will added the excitement to the gameplay as it allows players to win really big payouts at a cost of only $5.